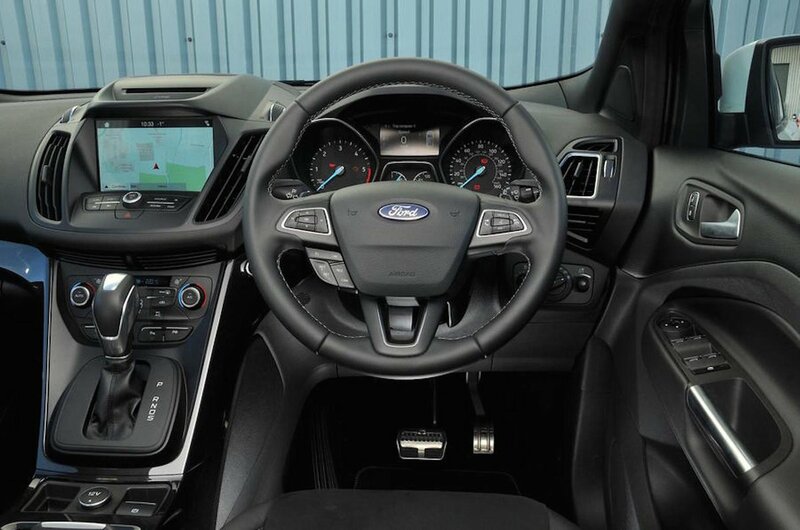 Ford Kuga Interior, Sat Nav, Dashboard | What Car? 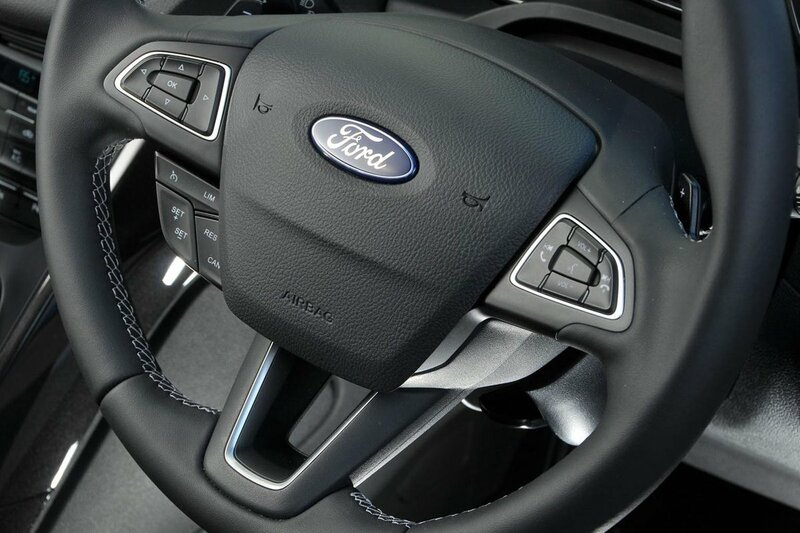 All Kugas have in-and-out and up-and-down steering wheel adjustment, along with a height-adjustable driver’s seat. 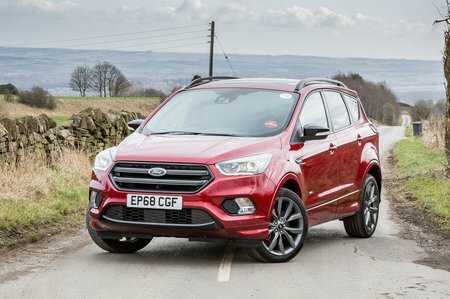 However, you do feel slightly closer to terra firma in the Kuga than in many SUV rivals – that might not appeal if you are looking for that SUV penthouse view of the road ahead. The driver's seat could do with a bit more support around the shoulder area, but is otherwise comfortable and reasonably supportive, with lumbar support adjustment standard across the range. A 10-way electrically adjustable driver's seat comes as standard from Titanium Edition trim and up. The Kuga's dashboard isn't as clear or logically arranged as in rivals such as the CX-5 and Kodiaq, but after a little familiarisation is reasonably easy to get to grips with. The view out of the front is hampered slightly by the curved corners at the bottom of the windscreen, but seeing out of junctions is easy enough, and front parking sensors are standard on ST-Line models and above. The Kuga’s chunky rear pillars hinder visibility out of the rear three-quarters, so it’s handy that rear parking sensors are standard on all but entry-level Zetec trim. Higher-end versions, again starting with ST-Line trim, have an automatic parking system. This will detect if a space is big enough and steer you into it, while you simply control the car's speed. Unlike many rivals, there's no LED headlights option, but Kugas towards the top of the range come with pretty efficient xenon lights. The standard halogen headlights are okay, but don't illuminate hazards quite as well, such as a cyclist on a dark country road. Even entry-level Zetec models get a DAB radio, Bluetooth and a multi-function steering wheel, along with a USB socket to charge your phone. However, Zetec has a different infotainment system to the rest of the range; its tiny 4.2in screen controlled by a confusing array of buttons underneath. It feels incredibly behind the times relative to the competition. We'd certainly recommend upgrading to the 8.0in colour touchscreen with sat-nav, Apple CarPlay and Android Auto if you're opting for Zetec, although this system still isn't as good as those you get with the CX-5 or Kodiaq. In some ways it is easier to use than the 5008's infotainment, though. You get the upgraded infotainment as standard on Titanium Edition trim and above. Sound quality is adequate rather than outstanding. There is an optional nine-speaker premium Sony sound system that is better, but still not brilliant. The CX-5 and 5008 are much classier inside than the low-rent-feeling Kuga; frankly, it looks and feels like a £15,000 small car inside, rather than one with an asking price starting at well over £20k. There are far too many hard, scratchy plastics on the dashboard and the buttons and switches feel rather lightweight. This is even more galling on the higher trims with more powerful engines, which push the Kuga's price into a territory where its interior simply doesn't cut the mustard. The range-topping Vignale model does at least have some fine-grain leather on the dashboard and seats, but ultimately this isn't enough to make up for its failings elsewhere.